Bridgwater & Taunton College held their annual Apprenticeships Award Evening at The McMillan Theatre to celebrate the success of their apprentices and employer partners. 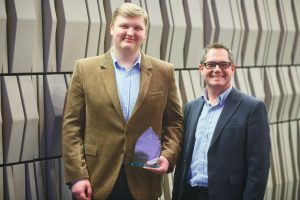 This year, after receiving the highest number of nominations for the ten award categories, 15 of the 3000 apprentices studying at the College and 16 of the 1400+ employers were invited to the awards evening to highlight their achievements. The evening was sponsored by Wessex Water and award sponsors included; BAM, Bylor, EDF, Learning Curve Group, Konica Minolta, Edwards Engineering, The United Kingdom Hydrographic Office and The National College for Nuclear, Southern Hub. Huge thanks was given to the sponsors, without them the evening wouldn’t have been such a spectacular event. Eddie Rant, Director of Utilities at Wessex Water was the first guest speaker for the evening. Each of the nominees tonight should be proud of their achievements. You are the generation who are going to change perceptions; your achievements will pave the way for apprenticeships to be recognised with the respect and esteem which you deserve. I would like to wish you all the best of luck, not only for tonight, but for the future. You really are good for business. The awards commenced with the Apprentice award categories and the guests were able to hear the reasons for each apprentice’s nomination, hearing their story and how they have benefited from the programme whilst helping the businesses they work for. Michael Jones, Manufacturing Engineering Apprenticeship at Thales UK, took The Higher/Degree Level Apprentice of the Year Award. Michael started his career young, becoming professionally registered as an Engineering Technician at age 17. He is very ambitious in his studies and is already far exceeding the expectations of his employer. Michael is also an active STEM ambassador and is keen to demonstrate to potential future engineers at school, that no matter your age or experience, you can achieve a lot if you have the right support. Thales are confident that Michael will continue to implement his learning and influence others with his excellent professionalism. Callum Young, Higher Apprenticeship in IT, Software, Web & Telecoms Professionals at UKHO, was the second guest speaker for the evening. I have been given the opportunity to work on tasks and projects that I have not only thoroughly enjoyed but have been able to develop additional skills from that I can add to my CV to support me with my career development and future job prospects. Thank you to the employers and manager that have recognised and taken on apprentices, knowing the benefit and experience you are giving them is invaluable. The evening then moved on to the Employer Award categories. M-CNC took the Small Employer of the Year award. As a local, family run business, they can offer over 30 years’ experience in the engineering industry to the apprentices and are providing the exact knowledge and skills that are required for the workforce. Bylor were awarded the Large Employer of the Year Award for their high quality apprenticeship opportunities to the local, regional and national population on an unprecedented scale for a construction project. 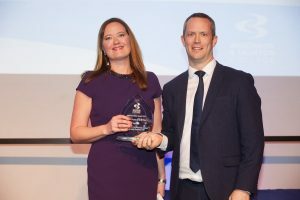 The Apprentice Advocate award went to an apprentice that continually champions the Apprenticeship programme, proactively promoting it alongside their role in their organisation. Samuel Winchester was delighted to win this award. The Overall Employer of the Year Award was kindly sponsored by The National College for Nuclear, Southern Hub. The award winners were Thatchers. Thatcher’s are extremely passionate about developing talent and have created a Young Talent Programme. This programme has the specific objective of creating an industry leading programme that not only created apprenticeship and graduate roles but also inspired and educated young people about the food and drink industry. Andy Berry, Principal of Bridgwater & Taunton College concluded the evening. He shared his inspirational story of how he began his career as an Electrical Apprentice. There are many avenues and routes an apprenticeship can take you. We couldn’t do it without our amazing employer partnerships and our hardworking, dedicated staff who go the extra mile to support our apprentices and employers. Our apprentices work so hard, not only when they’re in the workplace but also studying hard for their qualifications. We could not be prouder tonight and are thrilled to celebrate your successes with you. Please see photos from the Award’s evening here.